Rick Hill (Tuscarora) is an artist, writer and curator who lives at the Six Nations Community of the Grand River Territory in Ontario, Canada. 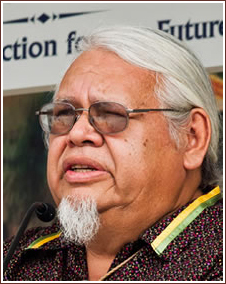 Over the years, Rick has served as the Manager of the Indian Art Centre, Ottawa, Ontario; Director of the Museum at the Institute of American Arts in Santa Fe, NM; and the Assistant Director for Public Programs at the National Museum of the American Indian, Smithsonian Institution; and Manager of the Haudenosaunee Resource Center. Currently he is the Senior Coordinator of Deyohaha:ge – Indigenous Knowledge Centre, Six Nations Polytechnic, Ohsweken, ON.